The War has raged for years The high-tech ammo is almost gone. High-tech equipment is failing, piece by piece, with no spares to fix it. The front lines are held by a few grim, desperate soldiers. The US 5th Division holds the line in Poland. Now, a Soviet encirclement has cut it off in a province ruled by ambitious warlords, local militias, and bands of marauding deserters. HQ is 200 klicks to the rear and powerless. "Good Luck. You're on your own." Generate Your Character: You select your nationality, chracter type, and your military and nonmilitary backgrounds. Equip Yourself: use your money for weapons, ammunition, equipment, vehicles and spares. Start Moving: You're in hostile territory. Your next encounter may be a friendly farmer, a frightened refugee, or a dangerous deserter. You pick your course of action; you decide your own fate in the chaos of World War III. 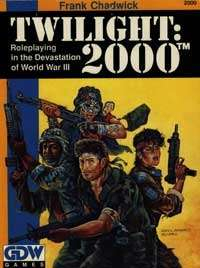 Twilight 2000's award-winning game rules provide the foundation for role-playing in the chaos of World War III. Combat: Fast-playing, easy-to-resolve comabt system gives the feel of modern battles. Travel: Types of travel, time scales, vehicles, encounters, maintenance, fuel, repairs. Encounters: Dangerous environments, radiation, disease, contaminants, reasons for encounters and typical adventures. Equipment: Weapons, supplies, vehicles, munitions, costs, availability. Danger: Places to go and reasons to go there. Plus reasons you wish you hadn't. Twilight 2000. The adventures are fast and furious. The prize is survival, and maybe, just maybe, a safe place to spend the night.